Lebanon is known for its rich culture, ancient ruins, medieval architecture, and meld of tradition and modernity. What most people don’t realize, however, is that this small Mediterranean country is also a skiing destination. 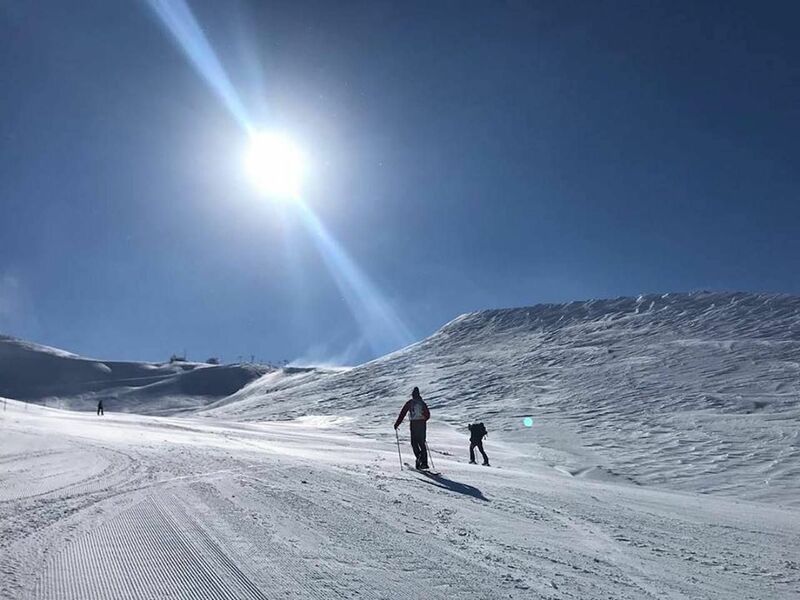 Yes, there are mountains here, and Lebanon is often referred to as the “Switzerland of the East.” Here’s why you should ski in Lebanon and a round-up of the resorts you can do so. 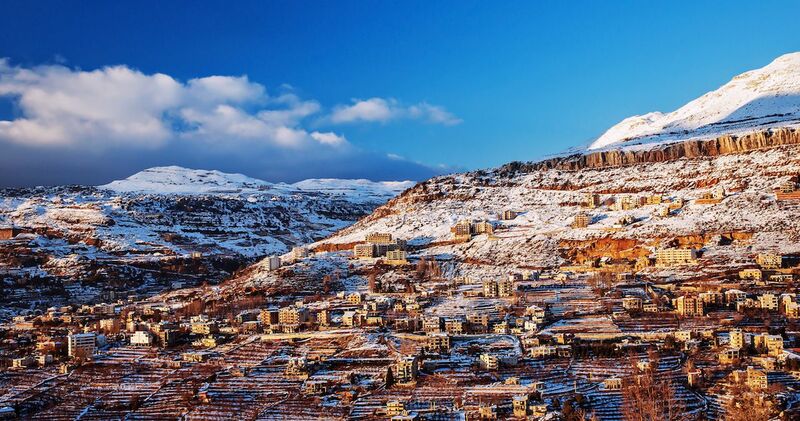 Skiing in Lebanon is one of the region’s best-kept secrets. 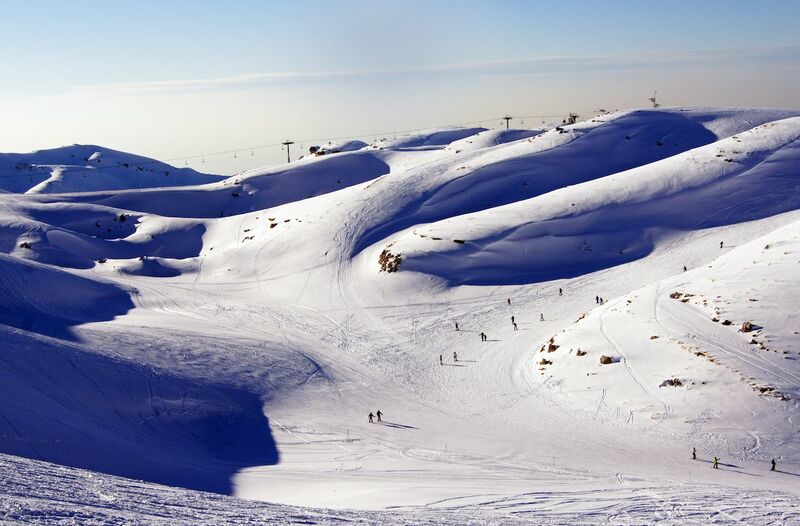 Lebanon has six well-maintained ski resorts, all within a short drive from the vibrant capital, Beirut. While Lebanon’s summits reach over 10,000 feet, most resorts are in the more comfortable 7,000- to 8,000-foot range. With a combined total of 190 miles of groomed runs, you can find slopes for skiers of all levels. Lebanon’s mountains begin their steep climb very close to the ocean. As a crow flies, the resorts are less than 20 miles from the Mediterranean, making for incredible sea views on clear days. You could tear up the snowy slopes in the morning, then shed your parka and head to the warm waters of the Mediterranean for an afternoon swim. While you could head down to the mountain for a dip, we recommend sticking around for the après-ski scene. You’ll find a variety of ski-in, ski-out accommodations, as well as options in the nearby villages. And few people know how to relax, enjoy good food, and celebrate into the night like the Lebanese. Beirut locals often drive up from the city just to enjoy the mountain air, dine at restaurants like Masaya Faqra, and hit up clubs in the alpine villages. If you happen to stay out too late to ski the next day, the mountains here are also home to Roman ruins, caves, and working monasteries. Or you can spend the afternoon snowshoeing through ancient forests or enjoying long lunches in historic villages. 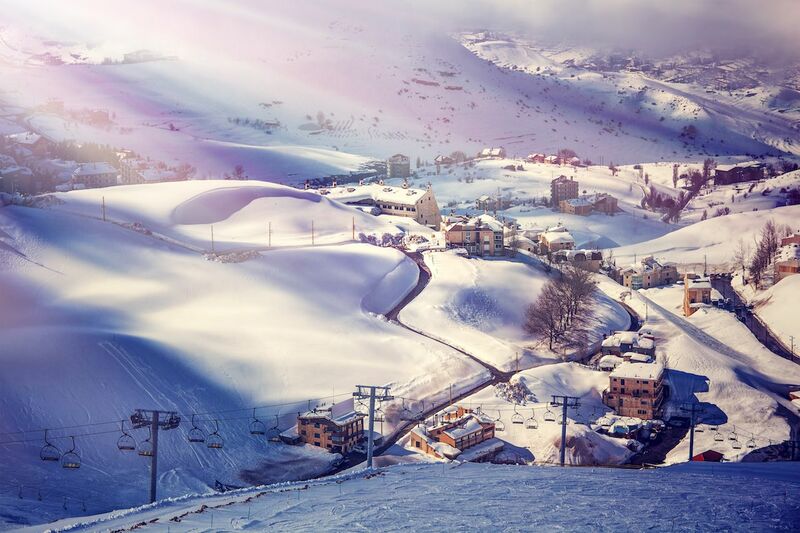 Mzaar, Lebanon’s biggest and best-equipped ski resort, is also the closest to Beirut at just an hour’s drive. It has 42 slopes, 18 chairlifts, and 50 miles of ski trails. Lower slopes are wide and gentle, making them best for beginners. Experienced skiers should head to the upper peaks for more challenge or hire a guide from the ski school to take them to areas of fresh powder. At Mazaar, you’ll have views of the Beqaa Valley to the east and, on clear days, Beirut to the west. The range of accommodations spans the luxury spa option, Intercontinental Mzaar Lebanon Mountain Resort; the moderately priced Urban Faqra Hotel right on a snowy hilltop; and Airbnbs. Besides skiing, at Mzaar you can also visit the ruins of a Phoenician temple and a Roman tower. 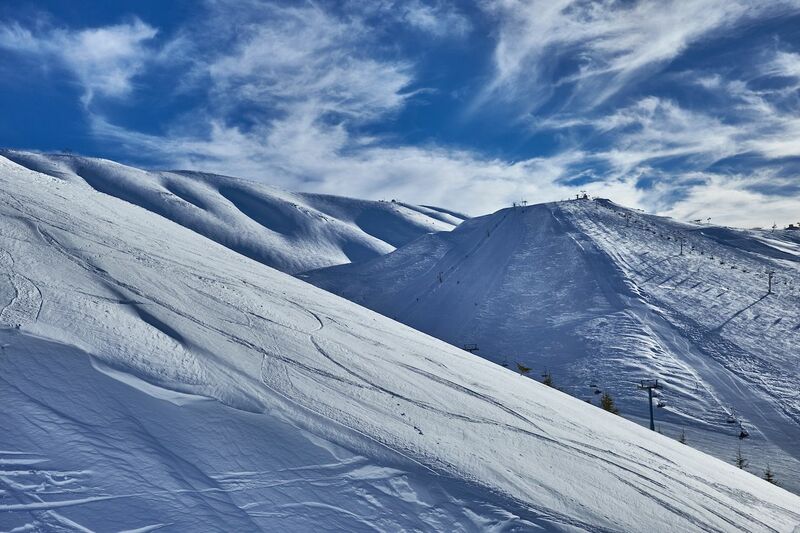 Located in the country’s highest range, The Cedars is Lebanon’s oldest ski area. In good snow years, you can keep skiing here until late April at these elevations — which reach nearly 9,000 feet. More advanced skiers will appreciate the steep slopes and off-piste options. There are also easy groomers for beginners and lots of terrain for cross-country skiers. Options in the town of Al Arz include the White Cedars Hotel with its lovely mountain views, or you can stay at the basic Bauhaus in Bcharre. 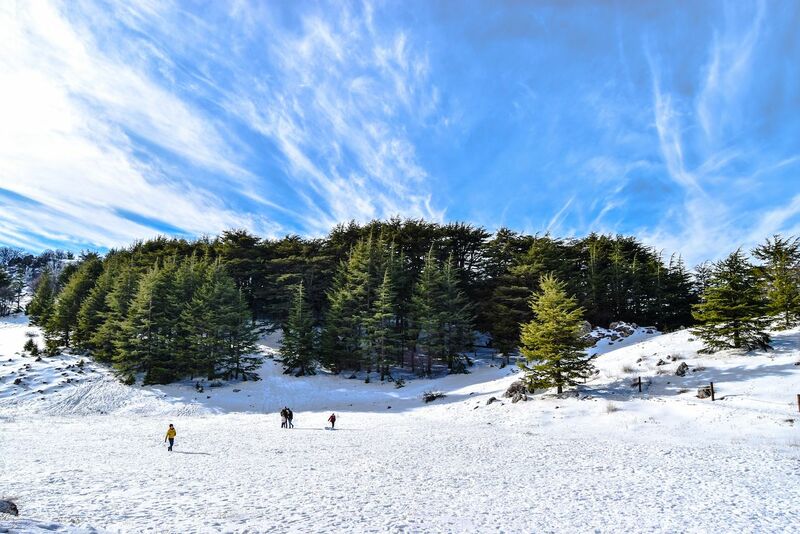 The Cedars is known for its Cedars of God forest reserve, full of ancient trees, as well as its stunning views of the northern mountains and Kadisha Valley. When you’re not making tracks, explore the nearby monasteries, churches, and villages scattered throughout the valley. Bcharre is especially interesting as it was the home of Lebanon’s famed poet, artist, and novelist Gibran Khalil Gibran. The museum dedicated to him is a repository for his work and personal effects. Families choose Laklouk for its friendly ski school. The busy pedestrian village is a hub of activity with restaurants serving traditional Lebanese dishes. Nearby, the legendary cave of Afqa and the abyss at Balou Balaa, with its natural arches and waterfall, have attracted visitors for thousands of years. The village of Annaya is another popular destination as pilgrims stop here en route to the Monastery of Saint Charbel. Qanat Bakish is known for its excellent snow quality and lack of crowds. Over half of the trails are suitable for beginners, making this a good spot to practice the basics and gain confidence. It’s a relatively small ski expanse with only 4.4 miles of terrain, so you can’t get lost. Or you can exchange your skis for snowshoes and trek up to the Cross of All Nations, the largest illuminated cross in the world. Be sure to check out the old village of Qanat Bakish itself, one of the best-preserved towns in Lebanon. Both the Zaarour Club and the Faqra Club market themselves as private club destinations for families — although the Faqra Club stands out for being one of the world’s first truly private resorts. The emphasis at Faqra, whose tagline is “Life at the top,” is high-end exclusivity. At Zaarour Club, it’s more about family-oriented fun. Anyone can buy a daily lift ticket to Zaarour, but the slopes are best for beginner and intermediate skiers and boarders. If you tire of those, you could try ski biking, sledding, and tubing. The only way to ski at the Faqra Club, situated on Mount Lebanon, is to stay at the L’auberge de Faqra, but we’re not sure how to actually secure a reservation there. No matter, there are lots of other wonderful places to ski in Lebanon.